It's not unusual to see luminous paint on watch hands and dials. In fact, it's just as common today as it was 60 years ago. Radium paint was used for decades but it gave way in the lat 1960's to other materials. Radium is a very commonly found element that is radioactive. The rays given off by the radium reacted with the paint and made the paint glow, 24x7, until glowing material in the paint burned out. It's not usual for watch collectors to go though a brief phase of panic when they realize their watch collection is radioactive. Do a little googling on "radium girls" and you'll see why. However, the radiation given off by radium paint is blocked by the watch, watch crystal and even your skin. So as long as you don't eat your watches, you'll be fine. During the 1950's Hamilton designers used radium paint on the back of the hour and minute hands of some models. That gave the appearance of the dial glowing and the hands were a silhouette. I'm sure that was very interesting when it was new - but after 60 years the radium can burn the dial. 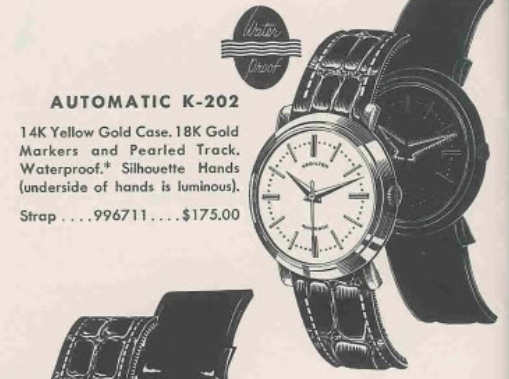 One of the models with "silhouette hands" was the 1956 Automatic K-202. It was produced for two years. 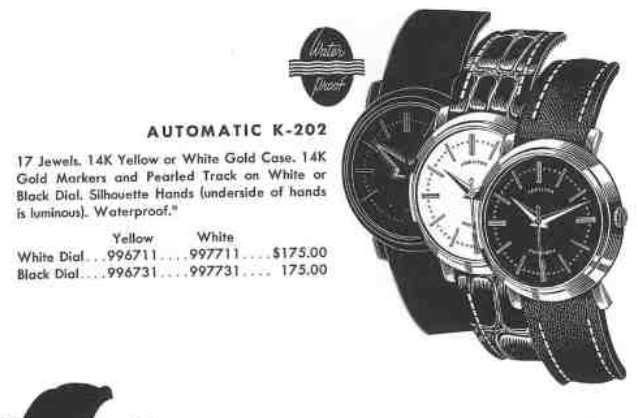 The 1956 catalog doesn't say much about the dial but in 1957 the catalog showed both a white and a black dialed version. I don't know if the white dial is truly white or if it is a silver butler finish... I think it's the latter. Regardless of the dial, the case for the K202 is solid 14K gold. Tucked within is a 17 jewel 661 automatic movement. I recently landed a K202 project watch and its the "white" dialed variety - although it's definitely a silver butler finish. It appears to be an original dial though, the dial is a little toned in the center from decades of exposure to the hands and the golden "pearl" track is in nice shape. The latter is a hard detail to get right on a refinish. The case back is nicely engraved with a presentation recognizing 25 years of service in 1958. Although the watch appears to run, there's something amiss inside... it's missing the automatic portion of the movement. The oscillating weight and the carrier with the reversing wheels is missing in action. This watch still works just fine but you have to wind it manually. Fortunately I have the extra parts needed to complete the watch so it will be an automatic again. The movement is reassembled and running with good motion. Time to put it on the timer and "listen" to how well it's running. Hmm... something its not right. It's running but it's not giving off a consistent rate. Something is making extra noise. Running it through the demagnetizer seems to get things running a little more smoothly. However it's still not looking too good. I noticed a tiny piece of lint stuck under the pallet bridge screw. I also recleaned the hairspring. Now it's running much better, but it's just a smidgen fast. A slight tweak or two to the regulator and now it's running with good time keeping, good amplitude and a good beat error. The movement is now running nicely and it has all the parts to be a complete 661 again... time to go back into the case. You can see that the dial has toned a little in the center thanks to the old luminous paint. The paint is gone now, so this watch is lume-free. With a new lizard strap, I think it's a fine looking watch - with or without silhouette hands.